Thanks to everyone that reads this blog! I’ve seen an increase in website traffic over the last few months, and every day more of you are signing up to the newsletter or following on Twitter. I started out the blog writing predominantly Horse Racing posts. It really is the best sport to trade on Betfair. Horse Racing practically exists for betting, and exploring the markets opens the door to a lot of opportunities as a professional gambler. But despite this, I wanted to steer Punter2Pro away from being just about Horse Racing. After all, the principles on this blog apply to any sport. Furthermore, in some situations (e.g. Matched Betting) you’d avoid Horse Racing events and look for another sport with lower odds — like football. For example, this last weekend I noticed that (pre-game) West Brom were 13.5 to beat United. It was unlikely they’d win (and they didn’t, it was a draw). But 13.5? To me this looked particularly good value — and I’m sure it was for Betfair traders that Backed pre-game and Layed in-play. Time and time again we’ve seen United fail to capitalise against ‘lesser’ teams. It’s interesting that other (better) teams inside the top 6, who have been far more consistent than United this season, wouldn’t be given that same level of expectation at home. These are the sorts of things I look for, and write about. The good news is, you don’t need to be a mathematician to grasp where a selection might be mispriced (but if you just so happen to be a mathematician, then that’s also handy). There’s also an ongoing football betting ‘experiment’ I’ve featured on this site: the Mug Bets. Mug Bets — How Am I Getting On? To accompany my football posts, I’m undertaking a ‘Mug Betting‘ experiment. In this ‘experiment’ I try to find an advantage without using any numerical analysis to support my selections. I simply look at the odds, form an opinion and then Back it on Betfair. This isn’t the way I recommend betting. But I know full-well that there are still several weaknesses and oversights made by mathematically compiling your own odds in a spreadsheet, and identifying value that way. So why not see how well I can do? To be fair, I’m doing pretty well. I’m currently holding a +10.53% ROI after 183 bets. There’s probably Tipsters selling their selections off the back of that sort of record! There’s no indication that I’m onto a losing trend, which is good. But the problem is, I haven’t gained any profit in the last few months. During this period the results have fluctuated, resulting in a ‘flat’ net position. So why have I stopped earning a profit? Well, here’s my thoughts. I may have been lucky at the start, and now the results are evening out. I made no secret of the fact that I expected my ROI to dwindle over time. This was the likely outcome following the flying start. My ideas worked well earlier in the season… and no longer do. My points of view might have worked well initially — but football isn’t static. If i haven’t adapted to new changes or circumstances, then my opinions might have weakened as a result. Increased pressure form teams to get results. Teams near the bottom are panicking and doing their utmost to avoid being dragged into a relegation battle (e.g. Palace beating Chelsea at Stamford Bridge!). At the top of the table the fight for top 4 is tight, meaning teams like Arsenal and United will sweat it out for a Champions League spot. To succeed with the Mug Bets I need to adapt the way I think about the upcoming fixtures*. I can’t hold the same points of view that I did earlier in the season. Additionally, there’s often unpredictable results towards the end of the season — so it won’t be easy. (*Or just get lucky. Rightly or wrongly, I’m quietly confident that I’ll pull through and end the season with a tidy profit). I write about value betting a lot on this blog. But I fully appreciate that it means nothing without evidence. After all, it’s not unreasonable to ask: can you really capitalise on ‘incorrect’ odds to earn a profit? after 1,564 £5 bets I’m almost exactly on the ev line. coincidence? It’s no coincidence that the results follow the EV line. If you have an ‘edge’ in your bets, then over a lot of data points (e.g. 1,564), you’ll expect to see profit in your results. 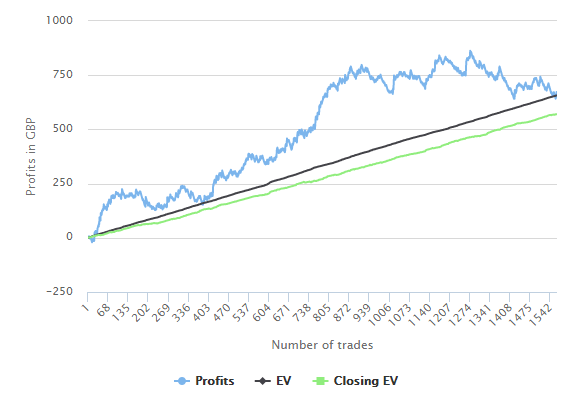 In this case the profit is almost exactly in line with the estimations given by Trademate. I record my value betting progress here. To learn more about the value betting subscription packages offered by Trademate, check out our shop, here. In the past I’ve written about Beating the SP and proven its profitability. But in practice, just how difficult is it to Beat the SP? This is what I aim to find out. I will use cheap, readily available tools on the market to make unbiased, ‘cold‘ predictions as to where I think the market direction will go. I’ll record my results and show them to you.